Etisalat 0.0kb free browsing cheat has been misbehaving on other VPNs including the new AnonyTun VPN. But now, there is a solution to the cheat not connecting. The developers of Stark VPN has released a new version of their vpn app v3.9 that has fixed the bugs that made Etisalat 0.0k not to connect. According to the change-log on Playstore, it says "Working etisalat ng tweak (not unlimited)". Stark VPN is a free and simple vpn application that works like Tweakware but unlike the former, you don't have to pay for any premium server in order to enjoy the available tweaks and servers on Stark VPN. This new updates also comes along with glo 0.00 tweak and fixed Etisalat 0.00 tweak that stopped working for some people in the past week now. So it's important you update it and enjoy the features this wonderful app has to offer. Make sure you uninstall the previous Stark vpn on your phone (if you have one installed) before downloading this one. >> Once the app is installed, launch it. >> Tap on Server and choose any server you like. >> Tap on "tweaks" then select your preferred cheat (Etisalat). It will connect within 10seconds. Note that this cheat is not unlimited. It's capped at about 60MB of data DAILY. At least, it's manageable. Just to be online and chat with friends on Socials. When you exhaust the 60MB of data for that day, it will stop connecting until the next day. If you have any problem, kindly comment below and I'll reply to you immediately. Don't forget to download our Android app to get notified of new free browsing cheats posted on this blog - DOWNLOAD HERE. Stark VPN v3.9 settings for Etisalat free browsing cheat. 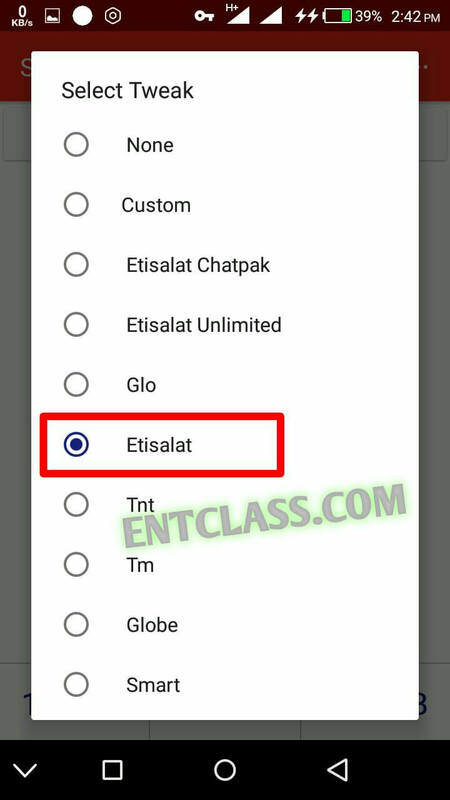 Etisalat cheat for Stark vpn v3.9. Download latest version of Stark vpn v3.9 apk Android. It's impossible as you said. But what are you still doing with such version of phone? It's working. Tested and confirmed before posting. When I saw the headline, I don dey happy.not knowing its still the same 60mg. It should work. It's still working. That's how it does. Just keep trying, it will definitely connect. Do you mean it refuses to install? Uninstall any Stark vpn on your phone. Then re-download from Playstore. Please how can I get this for my iPad?